SpaceX successfully launched the satellite into orbit Monday morning. SpaceX successfully launched yet another rocket Monday morning. But it wasn't carrying your average SpaceX cargo. The Falcon 9 rocket was actually used to send a top-secret U.S. government spy satellite into space. The unmanned rocket lifted off from Kennedy Space Center in Florida around 7 a.m. Monday. The launch was originally scheduled for Sunday, but it was scrubbed at the last minute because of a "sensor issue." SpaceX CEO Elon Musk noted in a tweet that high-altitude winds during Monday's launch almost exceeded the rocket's capability. And after it launched the National Reconnaissance Office satellite into orbit, the rocket booster turned around and touched back down at a nearby landing pad. The mission was SpaceX's first for the Department of Defense, a customer Musk has been trying to do business with for a while now. 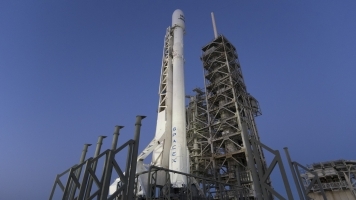 SpaceX received certification to launch satellites for the U.S. Air Force in 2015. Because Monday's mission was a national security launch, the finer details are being kept under wraps.